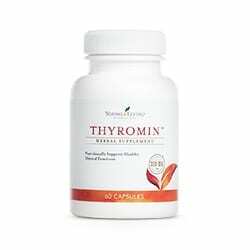 Thyromin Capsules are a nutritional supplement designed to nourish the thyroid. This supplement contains a combination of specially selected nutrients, herbs, amino acids, minerals, and essential oils. The thyroid gland regulates body metabolism, energy, and body temperature. Improve your thyroid health with this thyroid support formula. Why Is Your Thyroid Gland So Important? The thyroid gland determines the rate of your body’s metabolism. It regulates nearly every cell in your body. The hormones your thyroid gland produces regulate how your food is used for fuel. How fast or slow your fat is burned, they set your heart rate and temperature and much more! In short, the thyroid gland regulates body metabolism, energy, and body temperature. The thyroid works closely with the adrenal glands. In contrast, when the adrenal glands are stressed or depleted, the thyroid gland is forced to overwork itself to compensate. When this situation continues, the thyroid eventually decreases hormone production to conserve energy. In turn, this causes a cascade of symptoms and problems. One of them is obesity. One of the main reasons for obesity is low thyroid function (hypothyroidism). After all, because thyroid hormones strongly influence your weight and regulate every cell in virtually every organ of your body, it makes sense to keep your thyroid healthy, balanced and working optimally. Take one to two capsules daily, immediately before going to sleep. Keep in a cool dry place. Do not expose to excessive heat or direct sunlight. Keep out of reach of children. If pregnant or under a doctor’s care, consult your physician. * The information on this website is intended for educational purposes only. This is not provided in order to diagnose, prescribe, or treat any disease, illness, or injured condition of the body. The author and printer accept no responsibility for such use. Anyone suffering from any disease, illness, or injury should consult with a physician or other appropriate licensed health care professional. * This site does not provide medical advice, diagnosis, or treatment.